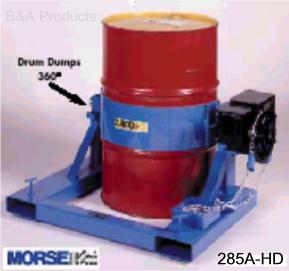 Transport, lift, rotate 360Â°, drain drums up to 2000 lbs. Converts your forklift into an all-purpose drum handler. Mounts quickly and easily on forks without tools. No modifications or connections to truck are needed. High strength saddle, alloy cinching chain and tightener with patented dual safety lock.10â€™ pull-chain allows control from the operatorâ€™s seat, rotates drum to any desired angle. 30:1 units have a gear drive, 60:1 units are equipped with a heavy-duty gear drive, 150:1 unit incorporates a 2-stage worm gearbox. Fork openings are 24-1/2" apart, accept forks up to 2-1/2" x 6-1/2". Battery Powered Karrier â„¢ allows precise power dumping up to 180Â°, forward or reverse. Completely self-contained unit has 12 volt DC hydraulic power pack and two-button control pendant with cord. Supplied with 12 volt deep-cycle battery and 110 volt AC charger. *Spark-resistant model. Has Monel saddle and stainless steel cinching chain to reduce risk of sparks.